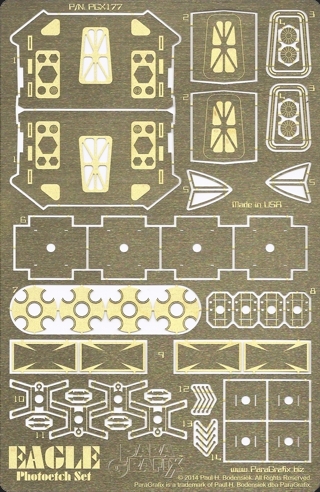 Update the venerable Eagle Transporter kit from AMT/ERTL with this all-new photoetch set. End caps for the transport pod with accurate raised and recessed details. Doors now line up with those on the framework support modules. Replacement airlock doors with the correct size and shape. Raised panel blast deflectors for the RCS (reaction control thruster) packs. Window frames for the Command Module. Landing gear updates with cages, pad hardware and “scissors” in both landed and in-flight positions. Scratchbuilding experience required to update the landing gear. Provisions included to allow builder to make their own working gear. Instructions are not included for making working landing gear. These details are left to the builder, who should have advanced scratchbuilding experience, especially with creating moving linkages.